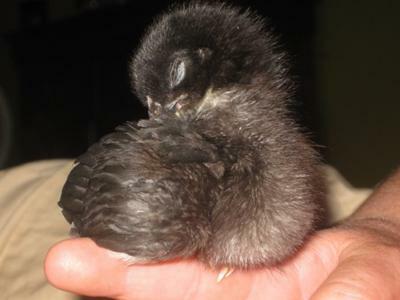 Baby Chicken Seeks Out Help from Police: I work as a Police Officer in a major metro city and about 2 weeks ago, while conducting a traffic stop, a baby black chicken suddenly appeared from underneath my patrol vehicle. We were in a parking lot next to a Golden Chick and a McDonald's, when all of sudden, while filling out the traffic citation, a passer-by said that I had a baby chick underneath my car! In disbelief, I got out of the car, and it was true.... somehow, someway, that I cannot explain, this little chicken sought out my help on that day. I wonder if it was the blue and red lights atop of my vehicle, or perhaps it's intuition that told it that I was a big animal rescuer as well as police officer. I am attaching a few photos in an effort to learn more about the wayward little chicken with the will of an elephant. Join in and write your own page! It's easy to do. How? Simply click here to return to Chicken rescue. Better By The Dozen: About a month and a half ago my sister (who works for a local animal shelter) called me from work with an interesting question. She wanted to know if we should adopt some chickens. At work that day they had received a call about some chickens that were dumped off and now running loose in a nearby wooded area, my sister and another officer went out and were able to catch three hens that afternoon. I said yes because we had been talking about getting some sort of farm animals for a while. We just couldn't decide what to get. So the next day she went to work and they spent the entire day catching the other eight hens and one rooster that were still running around. I started to convert a storage building on our property into a chicken coop. We spent the next couple of days finishing the coop with the help of some family members. That Friday, three days after the original phone call the chickens came home. We spent that weekend building an outside run for them. They have been with us for almost two months now and we love them. They have all been named and definitely have their own personalities. 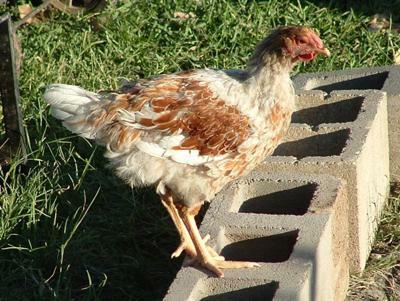 We have spent many hours doing research on how to raise chickens and identifying their breeds. Our rooster is a Plymouth Rock, and three hens are White Leghorns, three are Jersey Giants, four are Partridge Bantam Chanteceler, and one is a Ameraucana. A few of the hens started laying eggs two weeks ago. We get white, brown and blue-green eggs. They have been a wonderful edition to the family and my kids love getting to help take care of them. Response: Thanks for the great story Patricia. Keep up the good work and enjoy your new chickens. Flea Market Rescue: About three weeks ago, a couple of my friends went to the flea market to look for nerdy goodies. They noticed some hens a man was trying to sell for a few dollars each. I was told they were cramped, and looked tired. He claimed they were young layers. I requested they return with $20 and haggle for as many as they could get for that amount. Upon their return, they had one box. One hen. One very sad looking girl. She's a mix and we aren't sure what she is. Her comb was razored, her beak clipped and she also has a hole up high, by her nostrils. She is very thin. She doesn't know how to take a dirt bath, forage, or even know what grass looks like. She wants to be in a small cage. She seems happy locked up. I noticed she isn't eating much so we are now force-feeding before she falls ill.
We are encouraging her to free-range but she wants to be on the deck with us. She laid an egg...a shelless egg. She doesn't cackle or cluck. She also bites us. I feel so sad for her and we are trying to help her along. I cannot believe how people abuse animals. There will be more and I will try to bring them home. Let's hope "Lenora" makes it. Response: It may take her a while to get used to her new surroundings and life of luxury, but she will adjust. Great story! Thanks for sharing!